The Windows Store is still playing catch up with the Apple App Store and the Android Market. The number of apps available is higher than 175,000, and while that doesn't quite compare to Android and iOS, Microsoft says that 46 out of the top 50 apps on the other platforms are already available for WP8. Apps written specifically for Windows Phone 8 don't work on the older versions but all of the older apps are compatible with the new WP8. The Store is divided in three main sections - applications, games and music. A fourth section called Updates shows up when one of your installed apps has received an update - there's an Update all button, which will save you the hassle of updating each app individually. Anyway, each app will be listed with a short description, a rating and user reviews, a few screenshots and permissions. While the list of permissions isn't as prominent as it is on Android, the Store will explicitly ask you about the important stuff (e.g. location info). The Application section starts with a featured app, then it's on to the categories (you can list all or free apps only), followed by the top apps, a list of new ones and a longer list of featured apps. Nokia App Recommendations will help you get the best apps right off the bat, including a number of Nokia Lumia-exclusives (things like Nokia Weather Channel, which you might have missed) and categories like Starter pack or Shop til you drop. The Music section is actually the Xbox Marketplace. Its structure is similar to the Application section. First, a featured artist of the week, three more featured artists, then a list of new releases, top albums and genres. Genres themselves are separated into sections too - new releases and top artists/albums/songs/playlists. For each song, you get a 30 second preview (same as iTunes). If you have a Zune pass, you can stream the entire song (or download it DRM-protected), just like you would on a Zune player (it's 10 US dollars a month). The Games section is divided into Xbox Live, New, Featured and Genres, which is the categories version. A great thing about games in the Windows Phone Marketplace is the trial option, which is available to many games and apps. You can try before you buy. The new and featured sections act as what's new/hot reference. The Store on Windows Phone can be accessed via your WP device, or the windowsphone.com website, from where you can push apps to your smartphone. Search is available for the Store but right now it pulls together search results from all sections - games and apps alike. Microsoft have fixed the issue where songs would get mixed up in the search too, which was annoying. Anyway, the games themselves are housed in the Collection section. Nothing much to see here, the installed games are arranged in a square grid and there's a Get more games shortcut, which launches the Windows Store. Not all games support Xbox Live - the ones that do are in the corresponding section in the Store. Here you can also see your friends and their profiles, achievements and avatars. There are a few shortcuts to other Xbox Live-related apps - such as remote Xbox control (like the Store) or the avatar changing app. If you don't have them installed, you'll be redirected to the Marketplace, otherwise you'll get directly to the app in question. 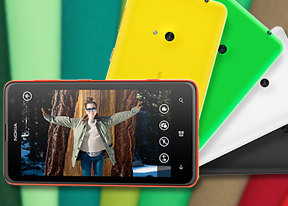 Being a high-end Lumia smartphone, the 625 gets the standard Drive navigation suite for free out of box. As usual its license covers a single country only. And since it's available offline you don't have to worry about roaming data charges, either. HERE Drive offers free, life-time voice-guided navigation. All you have to do is download a voice in your language of choice and you're good to go. Of course, to make use of the key selling point of Drive - offline navigation - you have to download a map for a country of your choice, too. With Drive you can easily plan routes (all offline, unlike the early iterations of this app) and you can tweak various settings for each route - fastest/shortest/economical route can be selected and you can choose whether the app will use or avoid motorways, toll roads, ferries, tunnels, unpaved roads and motor trains. There are icons to remind you of the selected settings. Drive uses big, clear instructions on its screen in addition to the voice prompts, which is ideal for in-car use. You can switch between 2D and 3D mode and switch the color scheme (day, night, auto). There are speed alerts and real-time traffic information. We do miss a few options - like setting a starting location other than your current location and downloading maps for an entire continent. Still, Nokia offer quality maps and offline voice-guided navigation out of the box, which puts them ahead of other Windows Phone makers an even other platforms (both Android and iOS require a data connection to plan the route). The most recent update to the HERE suite adds an overview of traffic conditions in your area, including your drive to and from work with the My Commute app. My Commute shows you an at-a-glance look at your specified commute with a special Live Tile on your homescreen. You can setup up multiple commutes as well. Nokia Maps takes on other duties - instead of navigation, it's more of a replacement for paper maps that you can take as you explore a city. It will help you discover new places, read a quick description, see photos, read reviews and check what renowned guides like Lonely Planet, Insight Guides and Qype have to say about it. The Maps app also offers walking, driving and public transport navigation but it only shows a list of instructions. It shares data with Drive so you don't have to download the same maps twice. With the latest release, the former Local Scout and City Lens features have been integrated into the Places section of HERE Maps, and gives you a quick view of restaurants, shops, galleries and other POIs around you, including an augmented reality view via the camera called LiveSight. Tapping the virtual signs in the camera interface pops up more info about the place, as well as directions.